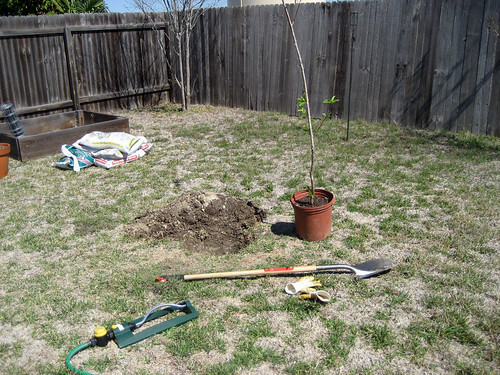 Here’s the tree about where I’ll plant it. 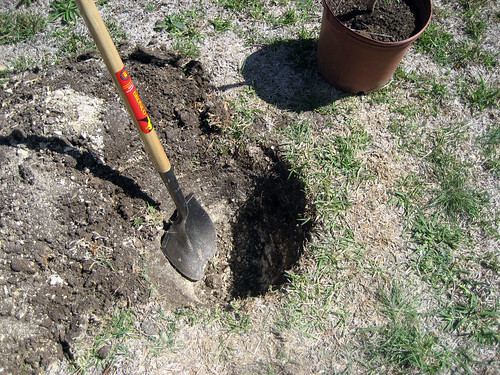 Here’s the hole I dug. It’s got quite a few more leaves on it now, too. It had one little tiny peach bud pretty quickly but the storms and high winds that came through in late March knocked that bud off the tree. I’m hoping more leaves = more buds soon. 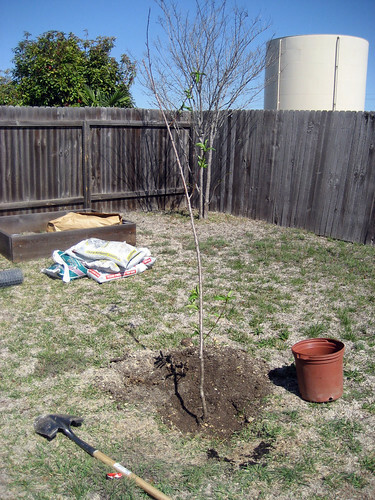 I’m just happy to have another tree in my barren back yard! After Stanley passed, I spent a lot of time trying to be home as often as I could be for Pfema. I think it took about a week or so for him to miss Stanley and now, he’s just kinda lonely. My dad says that animal don’t necessarily remember specifics like that for too long. The Jazz Ensemble kids were great and they showed up to school on Monday with tulips for me. I need to find a place to replant the bulbs…I think there are too many for the small pot they were in. I need to learn more about bulb planting – can’t be that hard. Later in April, our bands went to UIL Concert & Sightreading Contest. For the first time in Stony Point Concert Band (my group) history, we got 2-2-2 on the stage and 2-2-1 in sightreading. This is a great step for this ensemble and I’m so very proud of them. No trophies yet…just improvement. YAY!!! And that brings me to the other reason why I kept saying that April sucked – Keith and I broke things off. It wasn’t mutual at all but I respect his decisions. It’s really better for me in the long run. I, like Pfema, got beyond it pretty quickly…especially understanding who he is and how that is different from who I am. There are things about him I miss but honestly, I mostly miss the male companionship. Luckily, I have smart friends and for the most part, no one we both hung out with feels as though they have to choose sides. I guess it helps that we didn’t break things off angrily. This brings us to May – and BIRTHDAY MONTH!! It’s funny, a few years ago, you would have known May was birthday month WEEKS in advance but this year, I’m not feelin’ it as much. Maybe it’s because I’m a much happier person in general these days and I don’t need a special occasion for me to feel excited about life. Next Next post: AAAaaaaaaaaaaaaand sleep!